Attleboro, 8 @ Weston, 1 – Final – Attleboro junior Cam Litig record a hat trick, helping the Bombardiers avenge a loss to Weston from earlier this season and punch its ticket into the state tournament via the Sullivan Rule. Weston beat the Bombardiers 4-3 at the end of December. Jake Parker and Zack Pierce each added a pair of goals in the win. Foxboro, 3 vs. Norton, 2 – Final – Foxboro punched its ticket to the postseason via the Sullivan Rule, taking down D3 foe Norton 3-2. 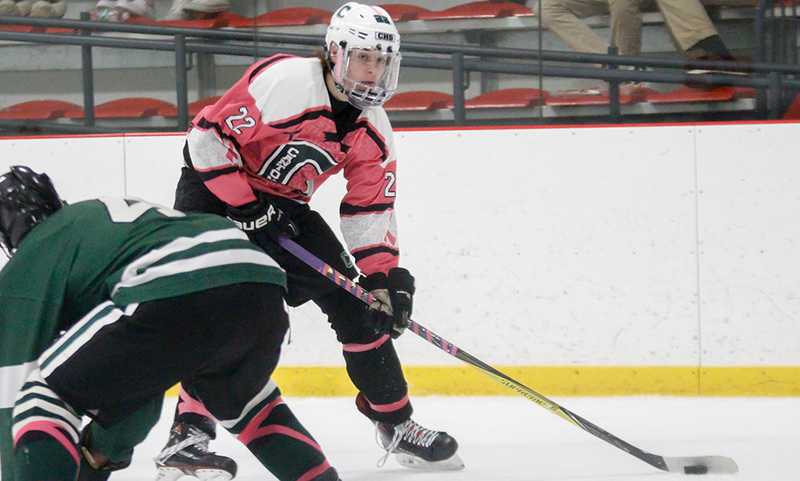 The Warriors built a 2-0 lead behind goals from Brady Daly and Taylor Sharfman. Norton tied the game but Kirk Leach scored the game-winner late in the second period. Mansfield, 1 @ King Philip, 1 – Final – Click here for a recap of this game. Oliver Ames, 5 @ Quincy, 2 – Final – Oliver Ames junior Brett Williams scored a hat trick to help the Tigers skate past Quincy. OA held a 35-22 advantage in shots on goal with junior Colin Bourne and senior Eric LeBlanc also tallying goals in the win. Taunton, 11 @ Durfee, 1 – Final – Taunton freshman Jordan Couto scored his first career goal and then added two more to record a hat trick in the Tigers’ win over Durfee. Cam Sneyd scored twice and had an assist, while Mike Albert, Will Walsh, Haden Weyant and Cam Faria each had one goal and two assists. Taunton moved to within two points of qualifying for the tournament with three games left. King Philip, 1 @ Franklin, 1 – Final – Click here for a Recap and Photo Gallery from this game. ATTLEBORO, Mass. – After missing out on Wednesday’s trip to King Philip, Trevor Pietrzyk made an instant impact on his return to the lineup against Attleboro on Sunday afternoon at the New England Sports Village. 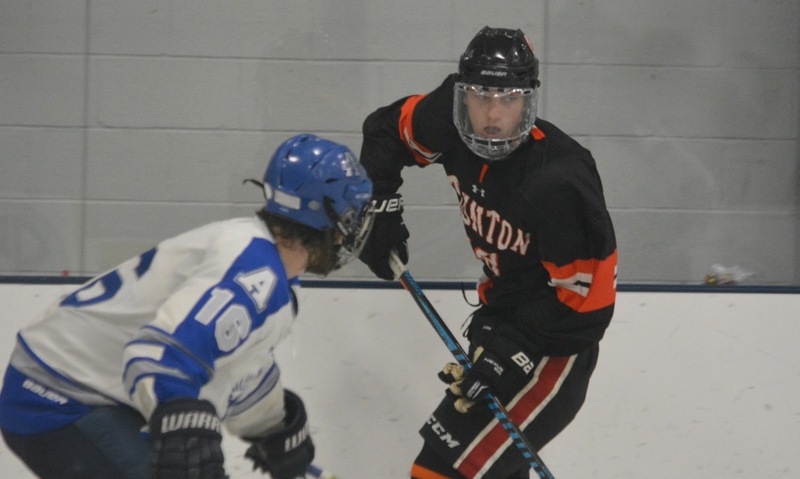 The senior forward scored a natural hat trick in the first period, including a penalty shot, on his way to four goals and an assist, as Taunton picked up an important 6-3 win that moves the Tigers closer to sealing a return to the postseason. Pietrzyk, who missed all of last season with an injury, got things started just three minutes into the game when he latched onto a rebound, following a right pad stop by Attleboro goalie Derrik Rivet, and knocked it into the empty net. Attleboro bounced back on the power play three minutes later. Jake Parker took the face-off and danced through three Tigers in the attacking zone before teeing up Ryan Morry for a one-timer inside the left circle to make it 1-1. The momentum would not stay with the home side for long. Two minutes after it was tied, Taunton regained the lead with Pietrzyk weaving his way through a pair of defensemen before flipping a pass to Cam Sneyd in front. In the span of seven seconds, Pietrzyk broke the game wide open. Attleboro went on another power play but the Tigers won the face-off in the defensive zone and broke out quickly. Pietrzyk was brought down on a shorthanded breakaway and given a penalty shot, which he dispatched with a lifted backhand. Off the ensuing face-off, Pietrzyk gained the zone and flicked a wrister from outside the left circle that snuck just under the bar. Taunton was buzzing with a 4-1 lead, but Attleboro would not go quietly. 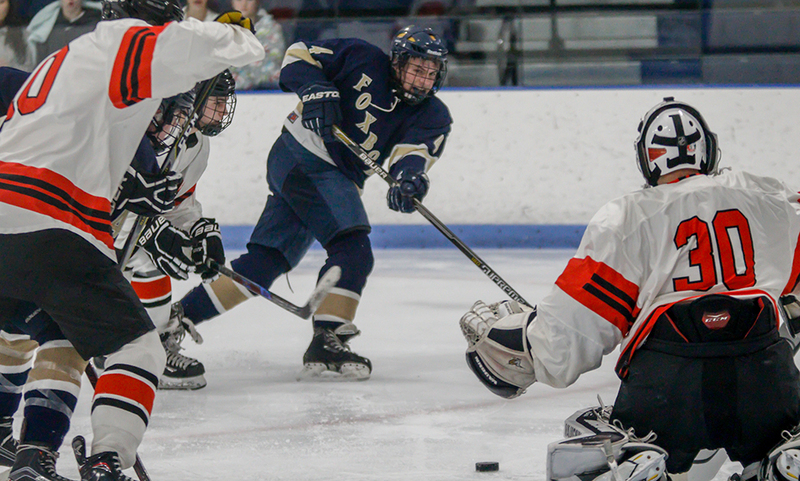 In the final minute of the first, Parker gained the zone and fired a wrist shot from the left face-off dot that Taunton sophomore goalie Sean Bunker got a piece of but not enough to keep it out of the net. Parker nearly cut the lead to single goal early in the second, but his shot from a bad angle skipped away off the crossbar. Morry also created a series of scoring chances as the Bombardiers racked up a 12-5 edge in shots in the second (after being outshot 14-6 in the first). Taunton almost added a fifth at several points in the period, but were denied by goalie Evan Andrews, who was injured and could not start but was brought off the bench after the fourth goal. He made a point-blank stop on Will Walsh, who had been set up by Jaden Weyant, and then closed the period with a huge back post stop on Jack Patneaude, after Walsh picked him out with a perfect saucer pass. Attleboro did cut the lead to one heading to the third. On the power play, Morry did a good job to block a clearance at the blue line and keep the possession alive. The puck swung to defenseman Kyle McCabe and his shot from the point was deflected right to Cam Littig who made no mistake with a one-timer. The Bombardiers came out for the third period intent on finding the tying goal and had a series of half-chances, including an Aidan Diggin effort at the near post on a loose puck that hit the side of the net and two chances with a man advantage, but after an early flurry Taunton settled down and limited Attleboro to few clear-cut scoring chances. The best chance of the period fell to Taunton’s Jake Roberts off a feed from Sneyd, but Andrews again went post-to-post to deny the forward. There was nothing Andrews could do a minute later, as Pietrzyk capped his night with an empty net goal. Sneyd added a second empty netter with 9.6 on the clock to make it a three-goal margin. Taunton (6-6-2, 1-4-2) will try to get two points closer to tournament qualification on Wednesday against Davenport leader Canton. Attleboro (5-5-1, 1-3-1) will host Mansfield on Wednesday night.